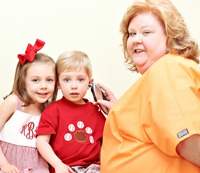 We are excited that you have chosen Gadsden Pediatric Clinic and Rainbow Pediatrics for your child's medical care. Your comfort and convenience are our priority, and we strive to make every visit to our office a positive experience. To help you get acquainted with our office and first visit procedures, we have included helpful information on this page. 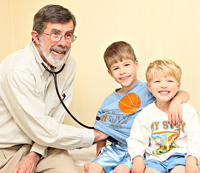 Gadsden Pediatric Clinic follows the routine office visit schedule as recommended by the American Academy of Pediatrics. Well child check-ups are important for maintaining good health and for detection and prevention of illness and developmental problems. Immunizations will be given at appropriate visits according to a schedule approved by the Advisory Committee on Immunizations Practices and the American Academy of Pediatrics. We recommend well child visits at the ages listed in the chart below.